DESTIN FL VACATION RENTAL - BEACHFRONT Townhome-- a 4 bedroom, 3.5 bath vacation rental located on a private beach, shared with 9 other units, in the Destin, Florida panhandle. Enjoy sitting in the sun on our private beach... Or watching the sun rise and set from your deck! 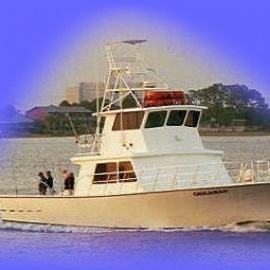 Or better yet -- what about drinking your morning coffee on the porch while you watch the dolphins play! Sound too good to be true? It's not! 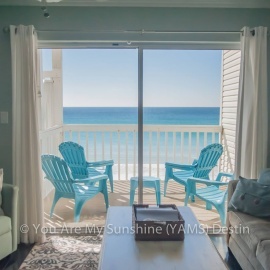 Welcome to You Are My Sunshine (YAMS) - Destin - a Destin FL Vacation Rental on the beach. 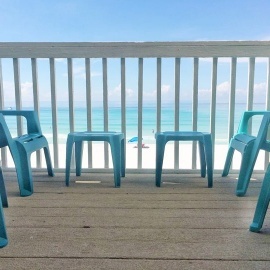 Here at YAMS - when you are standing on the porch and looking out at the Gulf of Mexico, it's hard to believe that the huge white sand beach and clear blue water are real! 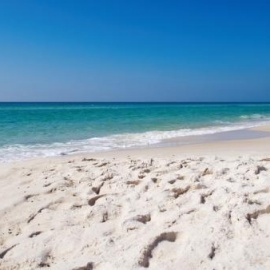 Destin beaches are picture perfect! GULF FRONT - Beachfront - Remodeled and renovated 3-level townhome with 4 bedrooms and 3.5 baths. On the 1st floor there are two bedrooms and a bathroom. One bedroom is beachfront and has a queen bed. The other is a bunkroom. They share a full bathroom. On the second floor you have the living area - to include a living room with 40' TV, a dining area and kitchen. The kitchen has granite countertops and travertine tile flooring. There is also a half bath. On the 3rd floor there are 2 bedrooms. They each have a king bed and private bath. The bathrooms have travertine flooring as well as travertine shower surrounds. One bedroom is street front and the other is beachfront.